There are many weekend backyard grillers who strictly use their propane grills as their appliance of choice when it comes to grilling. 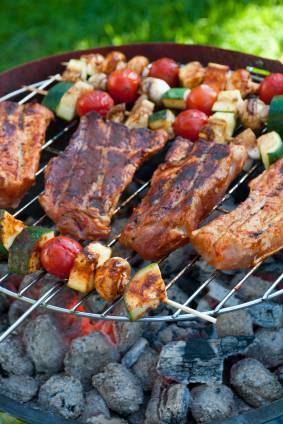 A propane grill is simple, fast, and the results are adequate. But if you want to make the experience of barbecue and grilling extra special, cooking with charcoal is my fuel type of choice. Cooking with charcoal can be a surreal experience as you progressively step through the various phases of the process with a keen interest and anxious anticipation. If you delve into the process of charcoal grill cooking, I believe that you will end up being a convert to this fascinating and fun mode of cooking. 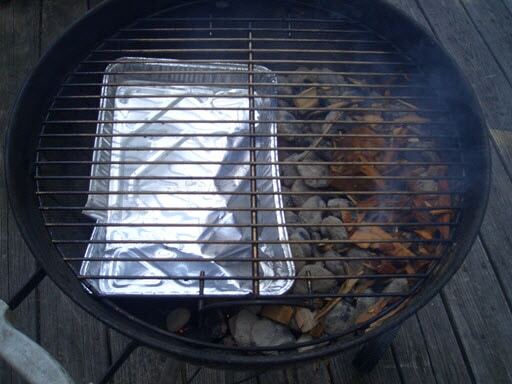 The process of cooking with charcoal begins with the chimney starter. A chimney starter is a cylindrical aluminum or stainless steel container with perforations in the bottom and in the sides to allow for sufficient air flow. The chimney starter takes the place of chemical lighter fluid that in years past was used to start a charcoal fire. Utilizing a chimney starter eliminates any lighter fluid gases or foul odors from affecting the taste of your food. You simply add some rolled up newspaper at the bottom of the chimney starter, light the paper, and wait roughly 15-20 minutes for the coals to be sufficiently lit and covered with a white ash. At the end of that time, flames will be shooting out of the top of the chimney starter which is what you are looking for. At this point, all you have to do is grab the handle of the chimney starter, pour the hot coals into your grill, and you are pretty much ready to grill. If you have only one type of food that you are cooking then a single zone fire is the typical method. A single-zone fire is simply where you pour all of your charcoal into your kettle grill and align them along the full diameter of the bottom grate at an even height. A kettle grill is a drum-like vessel and the most popular is manufactured by Weber. 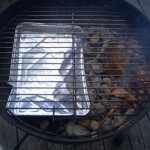 A single zone charcoal fire yields equal heat flow on the all of the food you are cooking. 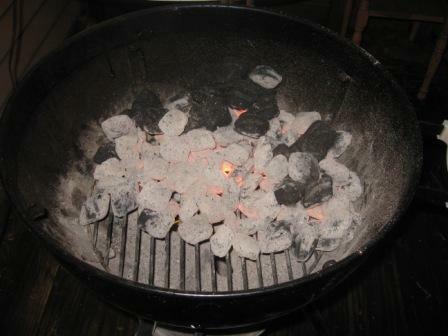 One technique that is used is the two-zone charcoal fire method. A two-zone fire combines both direct charcoal and indirect charcoal grilling methods. 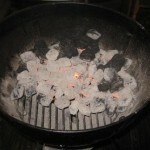 Direct heating is when the food you are cooking is directly over the coals. Indirect heat is where your food is not directly over the coals and is typically used for larger volume meats such as a roast or even a whole chicken. 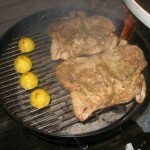 The goal is not to sear the meat but to cook it slowly over indirect heat. This slow cooking on low heat is typically referred to as barbecue. Although with the two-zone charcoal fire you could also sear the meat such as steaks of hamburgers directly on the side of the grill that is directly over the coals. 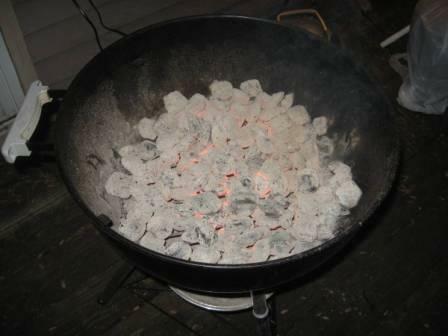 Another technique that can be used in a kettle grill is a three-zone sloped fire. This cooking scenario involves creating a pile of sloped charcoal where one side of the charcoal hill is close to the grate and your food and the low side of the charcoal hill is furthest away from your food. This allows you to place various types of food on one grate and cook them all at the same time. The high-temperature meat that you want to sear can be placed on the hottest side of the fire and the slower-cooking vegetables, baked potatoes, or seafood, can be placed on the side where the coals are furthest from the food. The image above is of my Weber One Touch Silver Kettle Grill one night recently when I was cooking spatchcocked chickens. 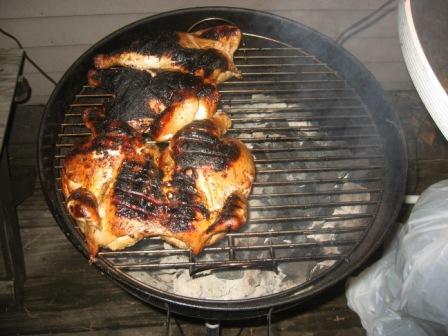 The way I grill these chickens is to place the chickens skin-side down on the side of the grill where the coals are closest to the grill (image to the left). This will provide a sear to the skin and will start cooking the birds quickly. 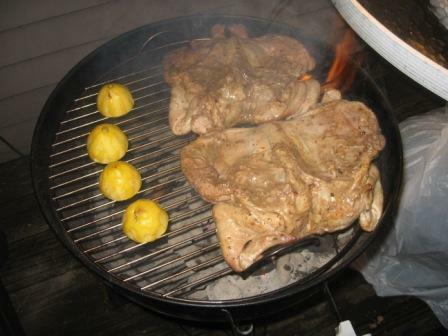 You will also note that I am grilling lemons on the low-heat side of the grill simultaneously. After I feel that the chickens have cooked sufficiently on high-heat side of the grill, I flip them and move them to the opposite side of the grill (image on right) so that they are allowed to cook at lower temperatures for a longer period. This low and slow cooking is referred to as barbecue. 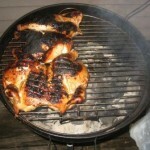 Actually, with the three zone sloped fire method I have utilized both grilling and barbecue to cook the chickens. Cooking with charcoal is a unique experience that takes a little time but is definitely worth it. In the case of barbecue and grilling, the speed and convenience of propane may not be the method of choice. Charcoal cooking opens up opportunities to utilize the various techniques to cook your meat, seafood, and vegetables properly. Once you turn to charcoal as a fuel source, you may discover that you’ll never return to the ease and simplicity of a propane grill. Enjoy the process of cooking with charcoal and you’ll definitely savor the mouth-watering results of that enjoyable experience.